Hello again. 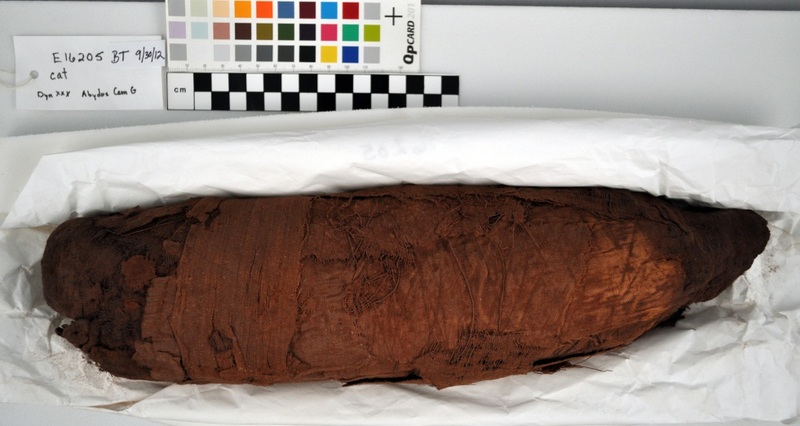 You may remember that last time I wrote about this cat mummy, I got a little distracted. But this time I’d like to focus on the treatment process. 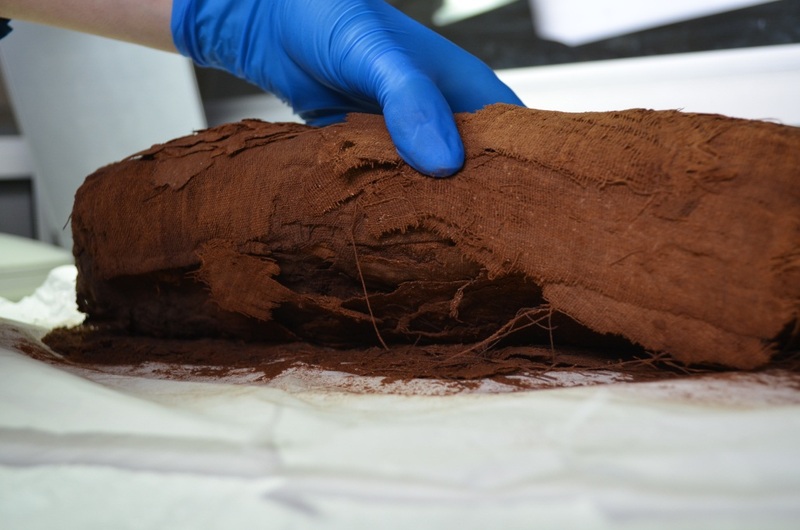 Many of our mummies are in remarkably good condition, with wrappings that are stable and that can withstand handling (albeit with care). Not so with this cat. When plant-based fibers age, the cellulose that gives them structure decays and the fibers become brittle. Badly aged linen can fall apart at the lightest touch, leaving loose fragments and powder on the surface of the object. The linen on top of this cat mummy was torn and obscured by dust, but the real problem was underneath. Prior to treatment, Molly and I carefully turned the mummy a little so we could see below—and quickly (but gently) put it back! As you can see in the image below, the layers of linen were falling apart and the threads that had criss-crossed the layers were broken and hanging off. 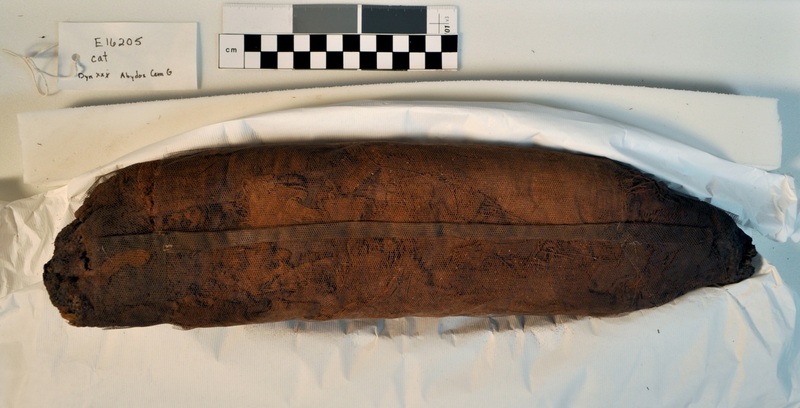 We decided to wrap the mummy in nylon netting, which would hold everything in place while keeping the surface visible. This would be a non-invasive, completely reversible process that would allow the mummy to be safely handled and studied. Before wrapping, I gave the mummy a light surface cleaning with a variable-speed HEPA-filtered vacuum. 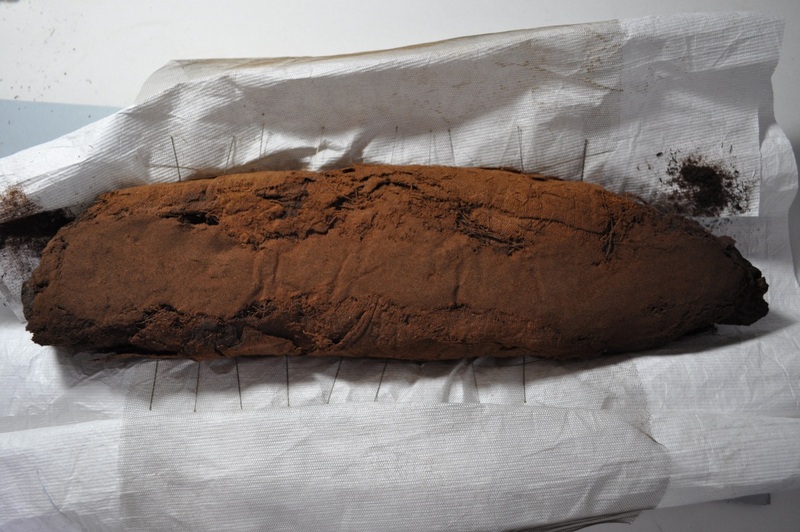 Using a nozzle attachment fitted with a screen, I carefully removed the powder on the top of the mummy. The linen—though torn—was still soft and flexible, like modern fabric. Then, I toned the netting to match the color of the mummy using acrylic paint. Once the paint was dry, I positioned the netting across the top of the mummy and pinned it in place. The flip was simple but nerve-wracking—we knew from our quick peek earlier that the underside was in bad shape, but we didn’t know to what extent. With Molly’s help, I turned the mummy over so that all of the powder, torn linen and broken threads were now on top. Since the thick layer of compressed linen powder completely obscured the wrappings below, I again vacuumed the mummy, using a screen to filter out the powder while keeping everything else in place. A vacuum may seem like an odd conservation tool (I got some weird looks as I hoovered the cat), but with the filter over the nozzle and variable suction control, there’s no danger of sucking up the entire object. The underside of the mummy after cleaning. It may not look like much, but it’s better! With the underside of the cat finally visible, I sewed the netting up the middle using a flat-felled seam. As the name implies, this created a neat seam with a flat profile. 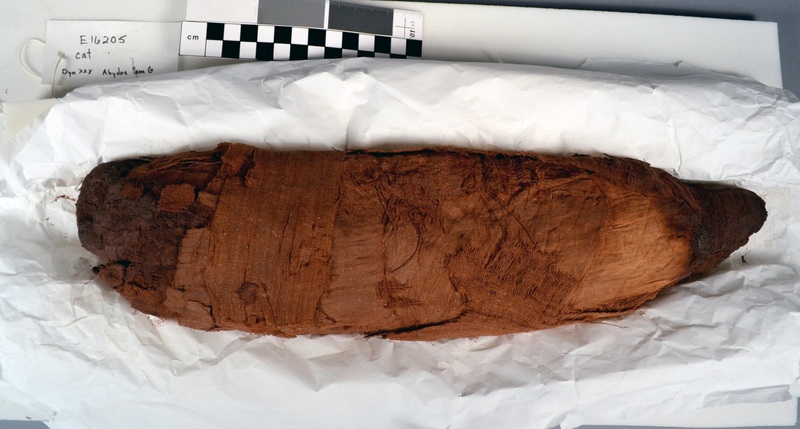 Now that the linen wrappings are encapsulated, the little cat mummy can be handled and studied, and it can (hopefully) be x-radiographed this fall. It still may not have its head, but at least it won’t be losing any more of itself any time soon. 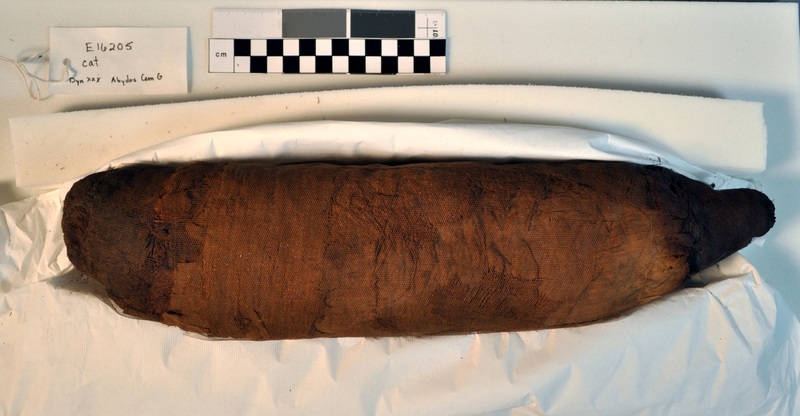 This entry was posted in Animal Mummies, conservation treatment, Objects In the Artifact Lab and tagged Abydos, cat mummy, nylon bobbinett by mollygleeson. Bookmark the permalink.